In the same way that Yogi is smarter than the average bear, this garlic butter is tastier than the average garlic butter. It’s fabulous stuff to have in the fridge. Garlic bread, chicken kiev, sauteed greens etc can be made with no fuss whatsoever. Heat an oven to 180oc. Break up the garlic bulb and place in small baking tray. Drizzle with olive oil, cover with foil and roast for 20 mins or until the cloves are soft to the touch. Squeeze the roasted garlic out of their skins and chop roughly. 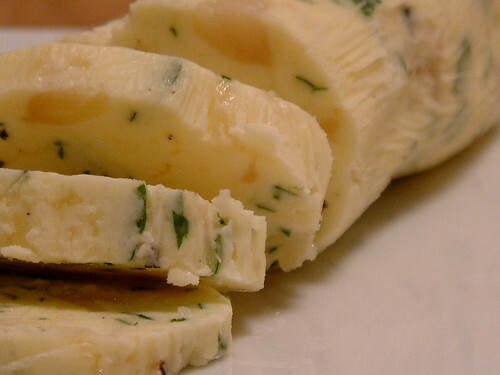 Mix roasted garlic, crushed garlic and parsley with butter. Season to taste. Place garlic butter mixture on to a sheet of clingflim (what do you North Americans call this again? Some kind of wrap? It’s the clear plasticky stuff). Fold cling film and mould mixture into a sausage shape. Wrap tightly and store in the fridge. Saran wrap is I think the phrase your looking for me’dear. I reckon you’re probably right about this – there’s something much nicer about using mellow roasted garlic but it’s nice to have a bit of the sharpness of fresh in there too. Great idea to roast the garlic – I’ve never thought of doing that for garlic butter. Not cheeky at all – I shall definately use this method. Thanks for the idea. Sophie – I wondered what the hell you were talking about for a second, then I said “saran wrap” out loud. That’s the American word for clingfilm. I always thought they meant “surround wrap” but just said it in a funny accent! Gloria – This on toast is heavenly! Thank you for this idea. My kids devour shop-bought garlic bread, but don’t like my home made- shame! Maybe they’ll prefer the subtler taste of this. But why unsalted butter? You’re allowed to be tired, but just this once. 🙂 Garlic butter is also fantastic allowed to melt atop a big, juicy steak. Naughty, but fantastic. No apology necessary. Good food is good food, and this is no exception. A slice of butter melted into a cob of corn. Love the recipe! This would be DIVINE with shrimp and diced tomatoes over pasta AKA shrimp scampi or with a nice filet of mahi-mahi. I just bought 4 pounds of unsalted butter to used in holiday baking and I may have to divert the use of at least a little of it to make some of this. I can taste it already. YUM! Nodwah – Unsalted because it allows you to season the butter to your own taste. Salted would be absolutely fine, of course. I’m just a bit of a control freak! Christina – 🙂 Glad you approve. Megan – I love corn on the cob. Fun food. Anh – You and me both! I’ve never thought of roasting garlic for garlic butter before, so this is an excellent and fully justified garlic butter recipe post IMHO:) Thanks! Pat – Let me know what you think! Yes, Saran wrap. That’s a brand name, Wendy. It’s just plastic wrap. I like these butters. I just cut the whole head of garlic in half and roast it that way, then squeeze the inners just like you. Saran Wrap and Cling Wrap are two brand names here in the States. So when you said clingfilm, hey you were not too far off! My favorite way to use this butter is on a piece of fish hot off the grill! I love making these butters as you can go wild and crazy with the herbs and “stuff” that you add. Mike likes it when I put chopped hot peppers in it also, but Mike likes hot peppers in everything! I can’t believe I’ve never, ever made it. I imagine melting, tender greens sauteed in it to be a very fine thing. Beautiful. And what would make you think you have to apologize for presenting a recipe on garlic butter? Garlic and butter? Come on. We’re all thrilled! The nice thing is that it reminds us that it can be made ahead and stored; I usually just make enough for an individual recipe. Wendy I tagged you for a short Meme today. I know you are very busy, so only if you have time. Cheers! Maryann – Do you find that the bulb roasting works with older garlic? Or only fresh garlic? Lucy – Greens really are superb with this. 🙂 It’s a staple in my kitchen. Betty – I realised this after making too much by mistake! Hi wendy, I like your first point about Yogi. Thanks for posting this, it’s one of those things I say that I would do, but never get round to, so thanks for the reminder. Hope that you’ll get some rest this weekend to re-charge. Nora – It’s very little effort for great results. I love having this in the fridge and just melting a blob on, well, anything! Maryann – Ok, will try that method again! In season, I roast fresh bulbs this way but the one time I tried roasting a whole older bulb (what’s usually sold in our stores) it didn’t cook evenly. Maybe it was just a bad bulb. Garlic Butter…how can you go wrong? The best compound butter of all time in my opinion! Call it low brow, but I call it sublime, and this recipe’s a beauty. Oh i cannot wait to use this recipe! Yum! Love garlic.